Although it rarely happens nowadays, I love getting into the great outdoors. Nothing is more satisfying than coming back to a big camp fire after a long day of hiking and making a hearty meal. Last weekend a few friends and I went camping in Yosemite and we went a little overboard with the food, spending more time cooking and eating than doing anything else. 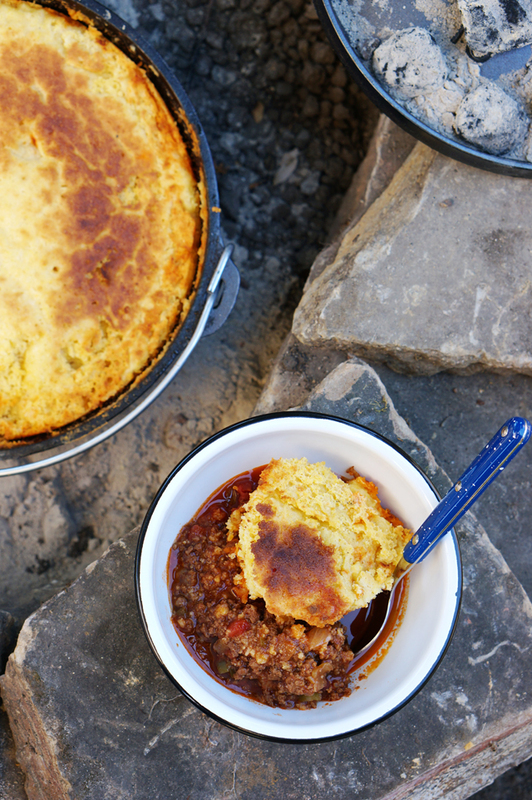 I made this dutch oven chili and cornbread and it was a hit! 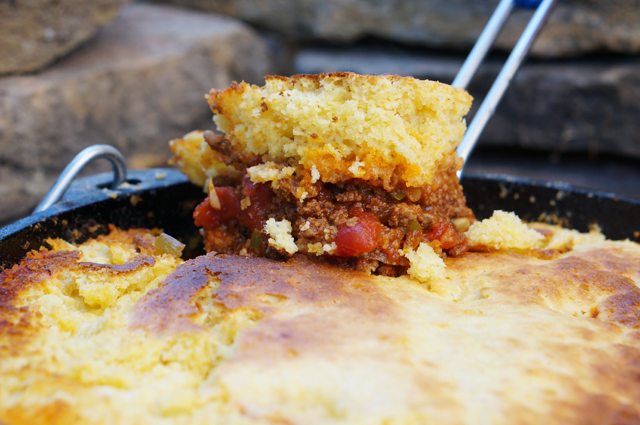 The spicy and smokey chili soaks into the bottom of the sweet cornbread. Everything goes into one big pot and the only item that needs to be kept on ice is the beef and egg and milk for the cornbread. I used an 8-quart dutch oven for this meal, but if you have a smaller one, you can just cut down the ingredients. The whole point of this dish is for it to be easy. Also, I recommend seeking out chipotle powder if you can. 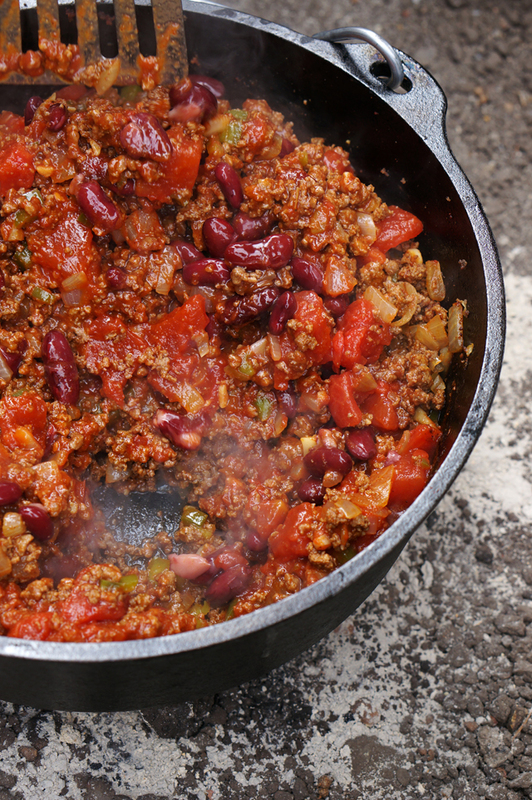 It gives the chili a smokey flavor and a kick of heat! This is the only time you’ll ever see me condoning the use of boxed cornbread. 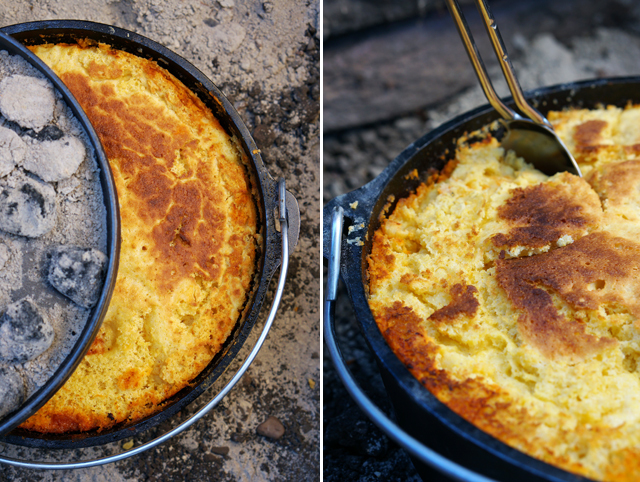 But really, Jiffy boxed cornbread makes for pretty amazing camp grub. 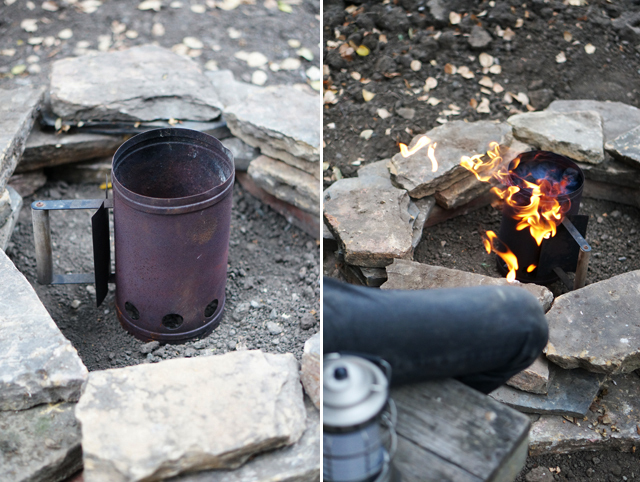 Start by heating the coals and make a layer of hot coals in the pit. You’ll need a lot of hot coals for this because you want your pot to be very hot to sear the beef. Reserve about 20-25 hot coals on the side for the top of the dutch oven later. Cook the ground beef until browned, breaking up the meat with a spatula. Add the bell peppers, onions and garlic and cook until the vegetables are softened. Then, add the chili powder, chipotle powder, cumin, oregano, diced tomatoes, and tomato paste. The chipotle powder is spicy so if you don’t like heat, omit the chipotle powder. Add the can of beer (or water) and beans and cook for another 10-15 minutes until the chili starts to simmer again. Season the chili with salt and black pepper to taste. While the chili is simmering, make the cornbread in a bowl according to the package instructions. I used two packages of Jiffy cornbread mix here but you could use one. Even though it may not look like a lot of cornbread, the cornbread expands a lot so a little goes a long way. I wanted to have a thick layer of cornbread so I made more, but you could use less. Ladle the cornbread batter over the chili. Close the lid and place about 20 hot coals on top of the lid. After about 10 minutes check on to see if the cornbread is done by sticking a skewer through the batter. If it comes out clean, the chili is ready. 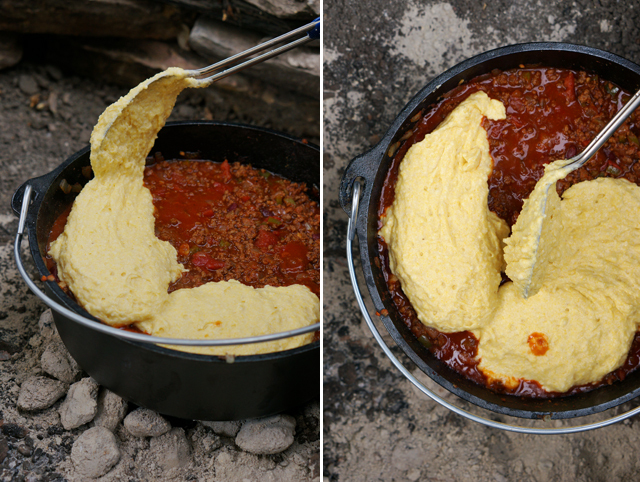 Remove the pot from the hot coals and serve by scooping a large spoonful of cornbread and chili into a bowl. This recipe will serve enough for 8 to 10 very hungry campers! Make a layer of hot coals on the ground. Place the dutch oven over the coals and allow the dutch oven to get hot. Cook the ground beef until it starts to brown, breaking up the meat with a spatula. Add the chili powder, chipotle powder, cumin, diced tomatoes, and tomato paste. Add the can of beer and beans and cook for another 10-15 minutes. 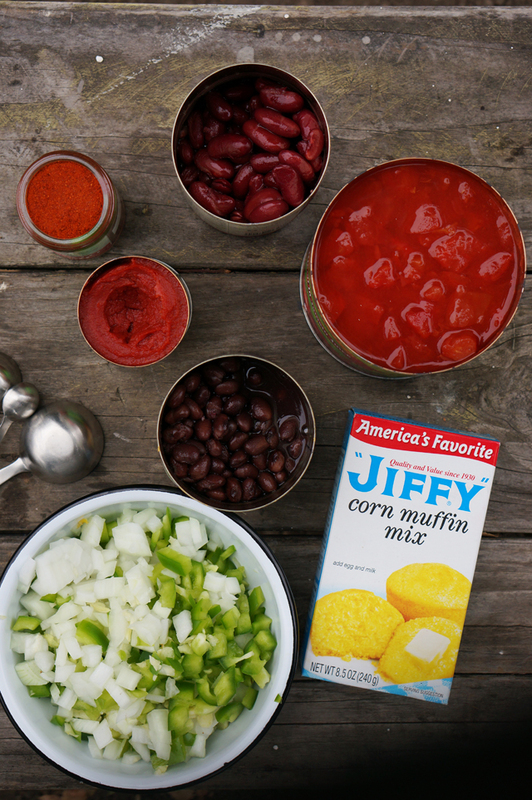 Make the cornbread mix in a bowl and pour over the top of the chili. 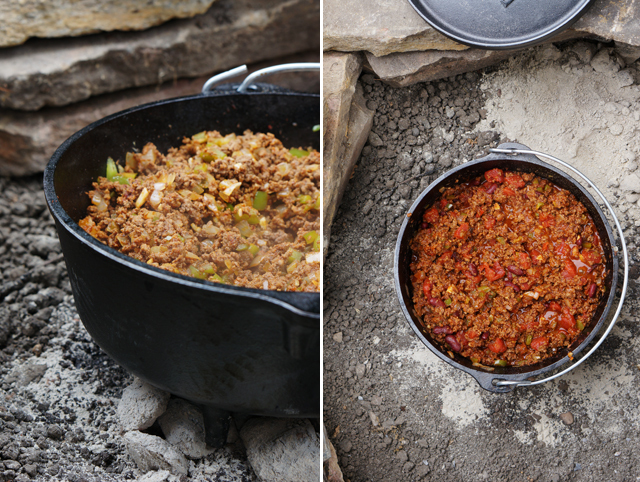 Place the lid on top of the dutch oven and place about 20 hot coals over the top of the lid. Cook for about 10 minutes and check to see if the cornbread is done cooking by lifting the lid and poking a skewer through the cornbread. If it comes out clean the chili is done. Hi! How would you suggest making this over a wood fire without coals? This sounds delicious!! I’ve never tried making this over wood so sorry I won’t be of any help! Sorry! Thanks for the great recipe. I’ve made it twice and everyone loves it. I also won best chili at a Boy Scout Dutch oven cook off with it. Thanks! I’m glad you loved it and that it won! I am most interested in trying your awesome-sounding recipe BUT prior to doing so, I have a couple of relevant questions. 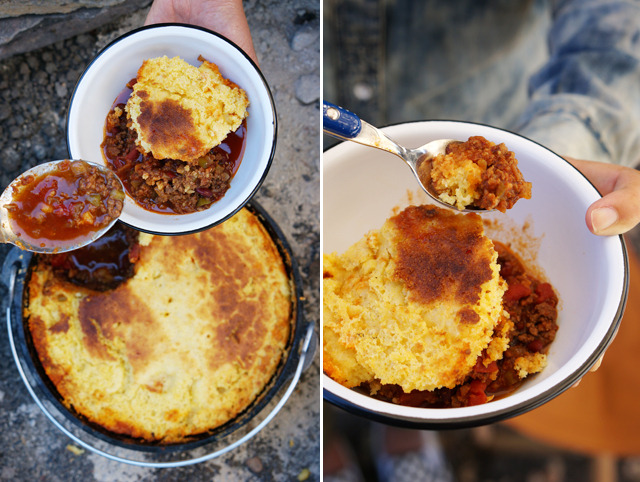 If using a dutch oven campfire-style (with briquets) and moist chili, (and using the 1/3rd bottom/2/3rd’s top concept), and a moist chili, the chili will a) steam a good bit and as it is b) under the cornbread layer, it will c) inhibit the firming of the bottom of the cornbread…which is already extra moist from the chili, resulting in d) a mushy layer between the cornbread and the chili. Not good…..
As an moderately experienced dutch oven chef, I simply do not grasp haw to make this dish….at a campfire…without at least two or three trial attempts in order to gain sufficient experience with a) number of briquets on top/bottom, b) cooking time, c) chili moisture content, and d) batter moisture…so as to avoid either the bottom burning and/or the overly mushy consistency at the center between the two layers. Any thoughts, suggestions, or modifications to this thought process would be most appreciated, as I am enthralled with the concept and want to use it Friday evening for a group of 10 folks…BUT I am reluctant to go-with-it without several test-runs. A 12-inch dutch oven is an 8-quart deep. The recipe calls for 2 boxes for 8-quarts. 4 boxes would make a lot of cornbread! For my tamale pie (a very similar dish) in an 12-inch cast iron skillet, I use 1 box of Jiffy cornbread mix. I made this when my family and I went camping with friends a few weekends ago. It was such a huge hit my 8 year old even went back for seconds. Thanks for a great recipe! NVM, lol. I promise – I scoured the directions but I see you mention 8-quart up above :). No prob!! Hope you enjoy! This looks AMAZING!!!! What size dutch oven are you using? Is this spicy? I’m wondering if the kids will eat it. What can I do to make it less spicy and to add flavor for the adults? It is spicy, I would swap out using the chipotle powder and just use chili powder! I want to make this so bad! But I don’t have a lid for my cast iron and it would be over a wood fire… Any chance it would turn out ok? You could try covering tightly with double layer of foil. Hope it turns out! What type of beer did you use? I won first place in the Camp Scoutmaster Chili cook off with this. Thanks!! 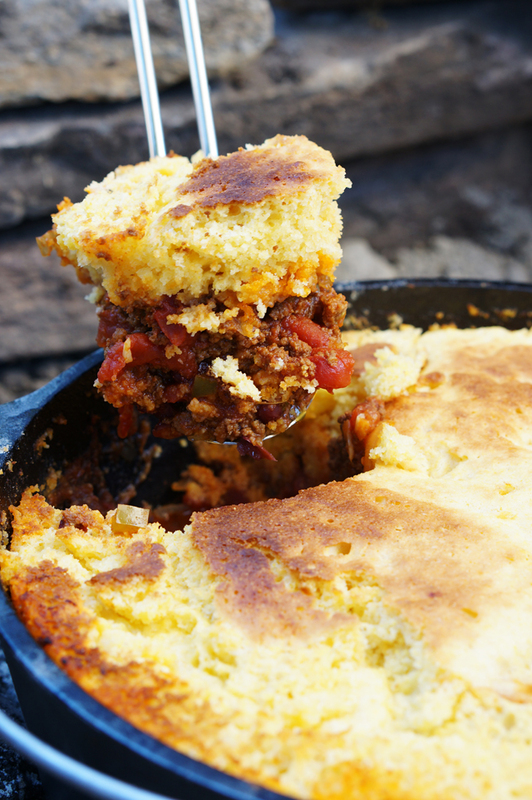 Can you simmer the chili a bit longer to develop flavors before baking the cornbread on top or is that not recommended because it would dry out? About how many coals on the bottom? or is there a certain temp it should reach?? Just want to make sure I’m able to get it hot enough to cook the corn bread. Thank you. so excited to try this! I do an even layer of coals. It’ll depend on how big your pot is. If it doesn’t get hot enough you can always lift the pot and add more to the bottom. Have fun! Wow…this is beautiful ! 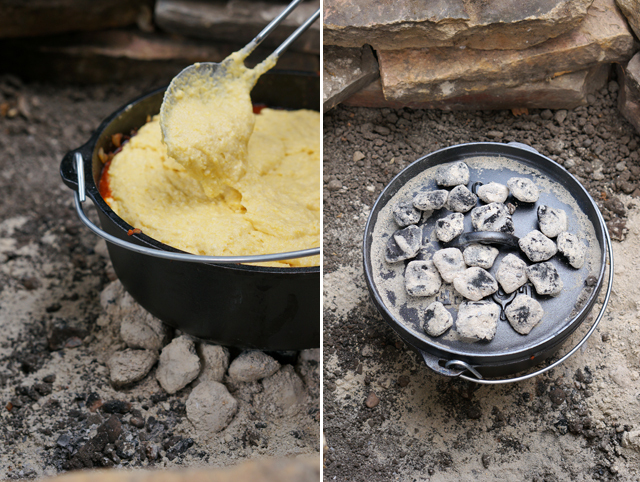 …Cooking such a wonderful dish on a campfire is amazing ! Can’t wait for my next holidays ! Thank you so much for this idea ! What if I want to make this at home and NOT at a campsite? How would I cook it? Like, what temp and for how long? To make it at home I would just cook the chili according to the directions over med/high heat on your stove and then bake the chili with the cornbread over the chili in the oven according to the box directions and temperature. Hope you enjoy! This looks amazing and what a delicious idea! Do you have instructions for using the oven at home? YUM! No. You. Didn’t. MMMMMMM dat looks good. If this is what camping looks like, I’m camping from now on. YUM. This is my kind of comfort food! Love it! This is so fun! My husband’s been talking about camping after he gets back from Afghanistan and I won’t lie, I’ve been less than excited. But if I can make this, I’ll definitely go!